Amp up your trail riding adventures with this all-new, all-conquering 29er. Whether you’re gunning for faster enduro times or bagging a big backcountry loop, do it like a boss on this big-wheeled singletrack shredder. It took years for our team of engineers, product designers and pro riders to create a new mid-travel 29er that met their high standards, but the wait was worth it. The rebirth of this trail bike marks a huge step forward, offering a true advantage in all-round trail performance. It starts with a full composite frame that’s fitted with our most up-to-date Maestro suspension. The Advanced Forged composite rocker arm and trunnion-mount shock help produce 115mm of smooth rear-wheel travel that’s active and sensitive to small bumps, giving you killer traction and confident control. And the frame geometry is all new, with progressive headtube and seattube angles, shorter chainstays and a longer toptube—all engineered to balance the speed and control of its 29-inch wheels with the quickness and agility you need to rail corners, hammer through rock gardens and do it all with confidence and control. 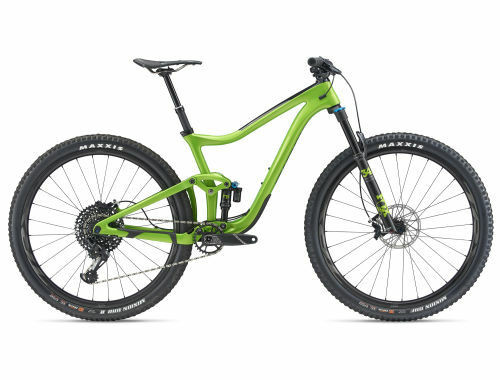 Larger 29-inch diameter wheels roll over rough terrain with balance and stability, giving you the momentum to tackle technical climbs and the confidence to fly on fast, rugged singletrack descents. Updated Maestro rear suspension features a trunnion mount shock with a longer stroke and smoother feel. With 115mm of full rear-wheel travel (and 130mm up front), it has the new Advanced Forged Composite upper rocker arm for increased stiffness and strength plus lower overall frame weight. The lightweight Advanced-grade composite frameset features updated geometry, including an aggressive 66.5-degree headtube angle and 74.5-degree seattube angle, plus a 44mm fork offset. The result is agile and efficient climbing capabilities plus added control for high-speed descents. Plašči [F] Maxxis Minion DHF 29x2.3, 60 tpi, EXO, TR [R] Maxxis DHR II 29x2.3, 60 tpi, EXO, TR, tubeless tires tested and verified to work best with Giant tubeless wheels, shipped with tubeless system setup from Giant factory providing the best tubeless experience and performance right out of the box. Just add sealant and your are ready to go! 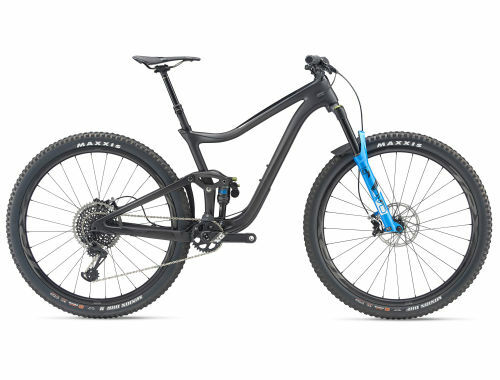 Amp up your trail riding adventures with this all-new, all-conquering 29er. It starts with a full composite frame that’s fitted with our most up-to-date Maestro suspension. The Advanced Forged composite rocker arm and trunnion-mount shock help produce 115mm of smooth rear-wheel travel that’s active and sensitive to small bumps, giving you killer traction and confident control. And the frame geometry is all new, with progressive headtube and seattube angles designed around 130mm of front-wheel travel, shorter chainstays and a longer toptube—all engineered to balance the speed and control of its 29-inch wheels with the quickness and agility you need to rail corners, hammer through rock gardens and do it all with confidence and control. High-performance grade raw carbon fiber and custom resin is used to produce this high quality frame in Giant’s own composite factory. Handcrafted monocoque construction makes it extremely lightweight, stiff and compliant. Updated “long and low” trail frame geometry with 66.5/74.5 headtube/seattube angles for aggressive handling is tailored for 29-inch wheels to optimize roll-over capabilities and high-speed momentum. Značilnosti kolesa Trance Advanced Pro 29 v Bibliji kolesarskih testov! Trance 29 Earns Bicycling Gear of the Year Award! Flow: New Trance 29 Trail Bike "Feels Fantastic"! Giant Launches All-New Trance 29 Range of Trail Bikes!